The book Drone Wars is an extensive anthology on the current debates surrounding the use of armed aerial drones in contemporary conflicts. The editors compiled a list of twenty-two essays and divided them into four major topic areas: drones on the ground, drones and the law of war, drones and policy, and drones and the future of war. Each topic area provides an in-depth view of the political, ethical, legal, and moral arguments surrounding the employment of armed drones. Contributing authors provide a wide array of opinions and observations detailing both the pros and cons of drone warfare. Many of the authors are subject matter experts in the fields of international law, policy, and strategy development. Others come from academia, media, government, and various think tanks from around the country. This impressive list helps to make the book an authoritative source on drone warfare. Drone Wars offers many new insights and approaches that are much needed in the drone debate. The book’s essay structure makes it particularly suited for teaching, also because there is quite some disagreement between the authors on several questions, such as whether drones are revolutionary, whether the US strikes are legal, or what the future of drone operations will look like. Drones are the iconic military technology of many of today’s most pressing conflicts, a lens through which U.S. foreign policy is understood, and a means for discussing key issues regarding the laws of war and the changing nature of global politics. Drones have captured the public imagination, partly because they project lethal force in a manner that challenges accepted rules, norms, and moral understandings. 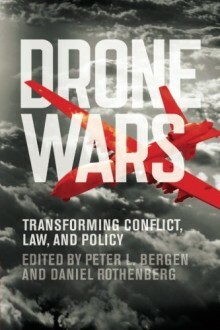 Drone Wars presents a series of essays by legal scholars, journalists, government officials, military analysts, social scientists, and foreign policy experts. It addresses drones’ impact on the ground, how their use adheres to and challenges the laws of war, their relationship to complex policy challenges, and the ways they help us understand the future of war. The book is a diverse and comprehensive interdisciplinary perspective on drones that covers important debates on targeted killing and civilian casualties, presents key data on drone deployment, and offers new ideas on their historical development, significance, and impact on law and policy. Drone Wars documents the current state of the field at an important moment in history when new military technologies are transforming how war is practiced by the United States and, increasingly, by other states and by non-state actors around the world.